You're welcome to visit all 10 blogs to see the wonderful artwork. If you want a chance to win a Michael Strong Whimsical Owls stamp set, you MUST leave comments along the way in all 10 blogs. Hetty will announce the winner next Sunday (Feb 10th 2013) on her blog. It is a circular blog hop, so wherever you start from, you will see them all. 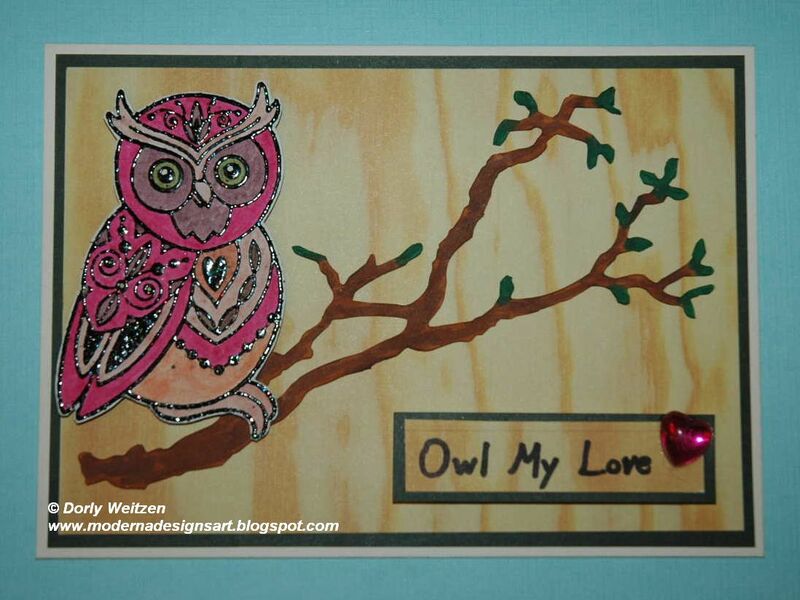 This is the card I made - Owl My Love. It was made for my DH, who's my true Valentine and the love of my life. Today is a very important day for us. We're ending a long, difficult journey, and hopefully we're starting a new time, more relaxed and happy. I hope I'll have more creative moments from now on, and I plan to blog, to share, and more… stay tuned! First I layered the papers on the card. I used the BirdBranch Die, and cut off the bird to use only the branch. I colored it using ProMarkers. Then I stamped the Owl and heat embossed it with Black Sparkle EP, to give it a shiny effect (look at its close-up photo). I cut it with nail scissors and colored it using ProMarkers. The sentiment "Owl My Love" was hand written by me. Both the Owl and the sentiment were glued 3D for extra dimension. Finally, I added the pink heart, to add some glam. I hope you get lots of inspiration and enjoy! WOW Dorly...what a great glammed up OWL - I'm sure your hubby will love it! 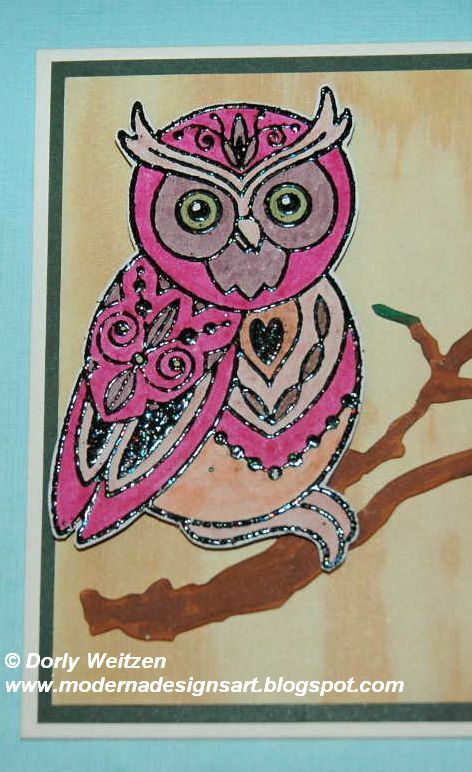 Owls are so much fun for Valentine and this is such a beautiful and bling card. I am sure your hubby will love it. Thanks for being part of our blog hop. Nice to see you on this blog hop, I'm enjoying it. Wonderful card you have made tooooo. Wonderful card. Love how you gave the owl some great 'bling' and am sure your husband will love it too- thanks for sharing ! What a darling card. 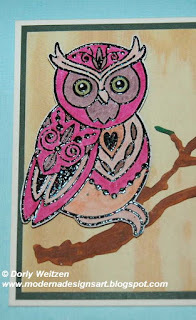 I love pink owl with the bling heart. I'm sure your DH will love it. Lovely card Dorly, with a special colour. I really hope more happy times will come your way! Beautiful card, I know your DH will love it. Thanks for sharing. I would never have thought of pink for the owl but it works so nicely! Great card! Lovely start to the hop Dorly, your colouring is super. I love owls. I use them on cards frequently, but I've never made one pink before. I think I will be doing it soon! Hi Dorly, Love the pink owl! Also love how she is perched on the tree branch - so clever. Thanks for adding to the fun today! Wow the black sparkly embossing powder is great on this! esp against the pink! Dorly your card is soooo cute. Love the idea of making it a valentine card. Thanks for sharing. Hi Dorly, love your bright pink owl. So cheerful!!! your use of color has inspired me!! You have inspired me with your use of color. Pink is my favorite! Oh! Dorly, your owl is a beauty. 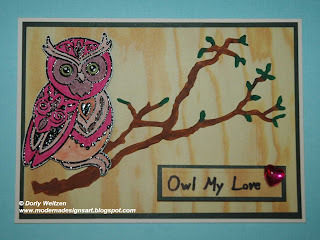 Dorly,amazing pink owl, I liked the words play :-), great to see you again at the blog hop!! See you soon, Smadar C.
So nice your colourful and sparkling owl! It will shine in the dark woods at night. Lovely idea for that special person or for Valentines Day. Thanks for the ideas. Hi Dorly check out my March 1st post.